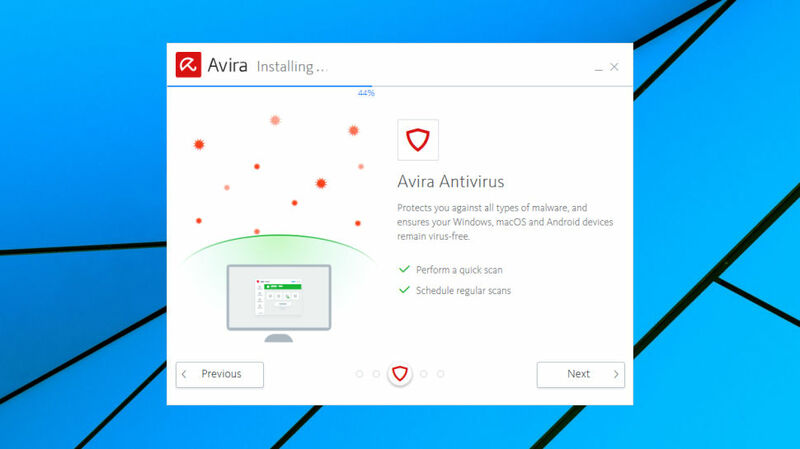 Avira Antivirus Pro 2019 is the commercial edition of Avira's popular antivirus software. The new release sees the debut of 'Project AGEN', which supplements checksum-based virus definitions with far more efficient pattern-based machine learning. 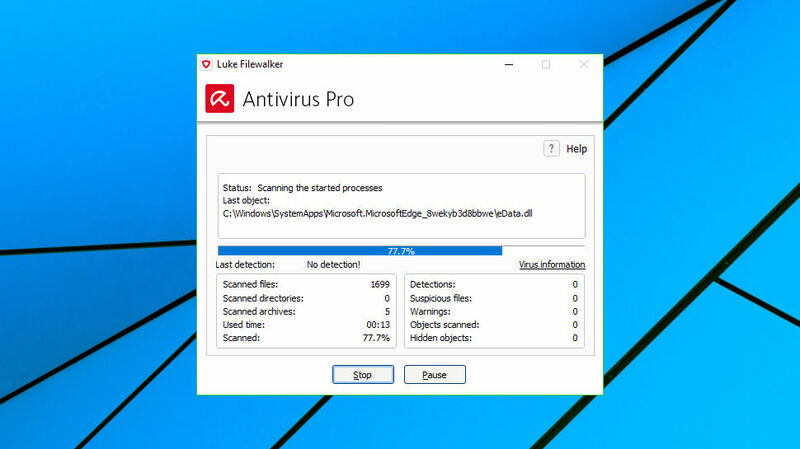 This can cut virus definition files by up to 75%, improving startup times, speeding up detection and reducing the time and bandwidth required for updates. Avira claims that the 2019 edition now averages '2-5 times better performance than other security products on the market' in terms of minimizing any lag during startup and operation. Sounds good to us, although these figures come from 'internal studies', apparently, so we'll need to wait for confirmation from the big testing labs. You'll get much the same speed gains with Avira Free, of course, but the Pro release has benefits of its own. The 2019 incarnation introduces smarter ransomware protection, with new behavior monitoring which can detect even brand new and undiscovered ransomware by looking out for suspicious actions. Other benefits of the Pro release include scanning of attachments, downloads and USB devices; faster cloud scanning; filtering of malicious websites, unlimited customer support, and no ads at all. Pricing options starts with a monthly plan, a rarity amongst antivirus vendors. This can protect a single device for £2.99 ($3.89) a month, three devices for £3.99 ($5.07) or five for £4.99 ($6.49). Although this is the most expensive way to buy Avira, it could be interesting if you're looking to test the service for a few months before you commit. A more conventional annual plan is priced at £29.99 ($39) for a single year, £51.99 ($67.60) for two years, £68.99 ($89.70) for three. Adding further devices saves you even more, so for instance a three device, one-year license costs only £38.99 ($50.70), and protecting five devices for three years costs you just £108.99 ($141.70), or £0.61 ($0.79) per device per month. Figuring out what's the right subscription plan for you could take a while, but we like Avira's flexibility. Whatever you buy, there's fair value on offer here, and Avira's prices compete well with Bitdefender, Kaspersky and the best of the competition. The easiest way to try out Avira Antivirus Pro is to download and install the free version. You won't get the premium benefits, but there's enough to give you a good idea of its speed and ease of use, and of course you can carry on using it for as long as you need. Testing the Pro version is more difficult, as we couldn't find a direct download for a trial build. Fortunately, there's a simple alternative. We went to the Avira Prime page (Avira's all-in-one plan which gets you all of its products for a simple monthly fee), moved our mouse cursor back to the browser tab, and a prompt asked us if we'd like a free one-month trial, no payment details required. 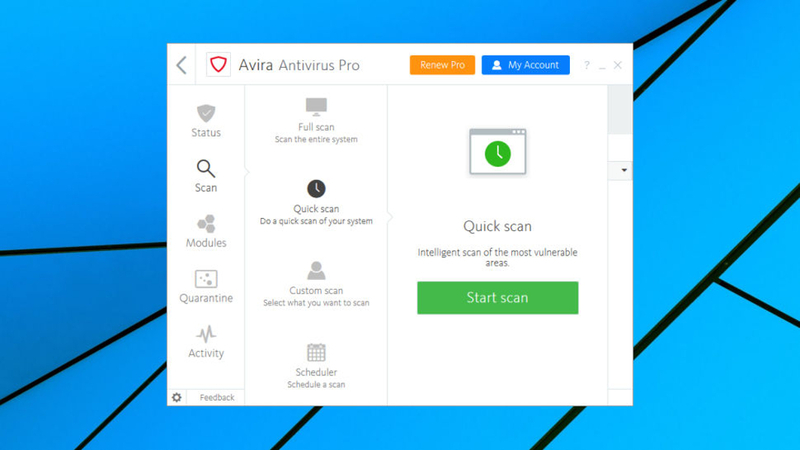 We accepted the trial offer, then downloaded and installed Avira Prime, which got us access to Avira Antivirus Pro 2019 and every other Avira product and service. There's a price to pay for this in the shape of up to 10 background processes running on your PC. Most require minimal system resources, though, and overall we didn't notice any significant performance impact on our system. Avira Antivirus Pro has a clear and straightforward interface which makes it easy to find the core functions you need. The opening console displays your security status, for instance, along with any active modules (Real-Time, Ransomware, Web and Mail protection), a Quick Scan button, and the date and time of your last scan. One glance tells you everything you're likely to need to know, and you can run a scan with a click. If the Quick Scan isn't enough, clicking Scan on the left-hand sidebar displays buttons to run a full system scan, or launch a custom scan to check a specific area of the system. Choosing a custom scan in most antivirus apps results in a prompt asking you which drive or folder you'd like to check. Avira gives you far more choice, with predefined scans to check your Documents folder, the Windows folders, removable drives, active processes and more. You can also save new custom scans to check specific drives and folders, making it easier to recall them later. You're not able to define how these custom scans work (file types to check or ignore, detection methods to use, and so on), unfortunately, as you can with Avast and some others. Experienced users might miss that flexibility, but this isn't a major problem, and if you don't plan on creating custom scans you'll never even notice it's an issue. If you're intent on customizing scanning operations, Avira Antivirus Pro has some interesting expert-level settings. You don't just get the usual 'Scan archives' checkbox, for instance: you can choose the scan types to check, have Avira detect archive files even if they have a different extension, and set the recursion depth of the scan. The latter means that if a ZIP file contains a ZIP, which contains a ZIP, which contains a ZIP, and so on, how far down the archive-related rabbit hole do you go? There's a similar level of control elsewhere. 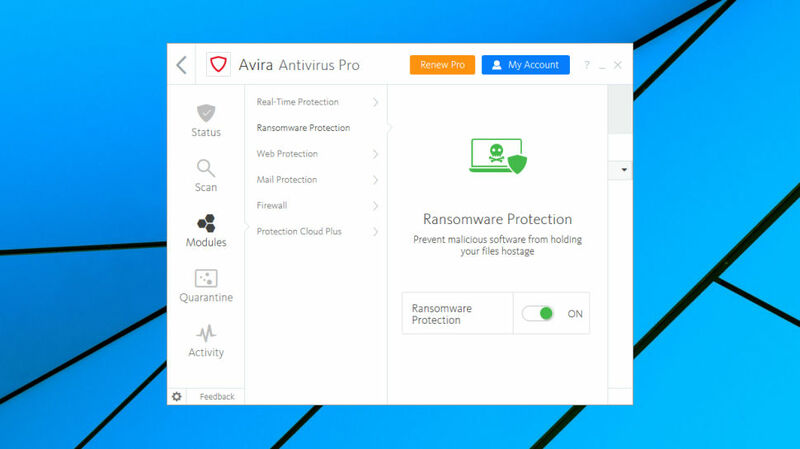 While other antivirus tools might allow you to turn web protection on and off, and that's about it, Avira allows blocking suspicious I-frames, particular file or MIME types, adjusting the detection level, tweaking the reporting rules, and more. The average user may not care about any of this, but they won't have to deal with these complications unless they go looking, and on balance we think it's good to have this level of configurability available. One issue we noticed is that Avira's local help file didn't explain all the available options, presumably because it was dated 2014. We found more advice online, but that's still a poor performance for a commercial product, and we would expect a company the size of Avira to keep its documentation more up-to-date. AV-Comparatives' Real-World Protection Test regularly checks 18 top antivirus engines against the very latest malware threats. The August 2018 results saw Avira manage an excellent third place, only very fractionally behind Bitdefender and Kaspersky (all three blocked 100% of threats, Avira's sole issue being that it raised a single false positive). Single tests can be misleading, but AV-Comparatives' February to June report (a summary of five tests) places Avira in a very similar fifth place with a still-very-capable 99.7% protection rate. The AV-Test Home User Windows tests offer more confirmation, with the previous edition of Avira Antivirus Pro achieving a top 6/6 rating for Protection, Performance and Usability. Only three packages managed that, out of a field of 18. As Avira Antivirus Pro also claims to have improved ransomware detection, we decided to pit the program against our own custom ransomware simulator. This was very basic and didn't use any stealthy malware tricks, but as we coded it ourselves, we knew it wouldn't be in Avira's signature database. The only way the package could detect our threat was by recognizing its behavior. We launched our ransomware simulator, then watched as it successfully spidered through multiple folders in our test folder tree, encrypting more than 6,000 documents and data files, without Avira Antivirus Pro raising any alarm or making any attempt to spot it. This isn't what we wanted to see. Kaspersky 2019, for instance, not only managed to detect and kill our test software, the package also recovered the six files which were encrypted. However, these results should be interpreted carefully. We think our ransomware simulator is a good way to highlight tools with effective malware detection, but failing the test doesn't necessarily mean a package is bad. The reality is that our ransomware simulator wasn't real malware, and there's no way to be completely sure why Avira Antivirus Pro ignored it. This issue has to be a concern, but the reality is that AV-Comparatives and AV-Test regularly test Avira's engine against known and brand new threats, and in these more thorough tests, the program performs very well. 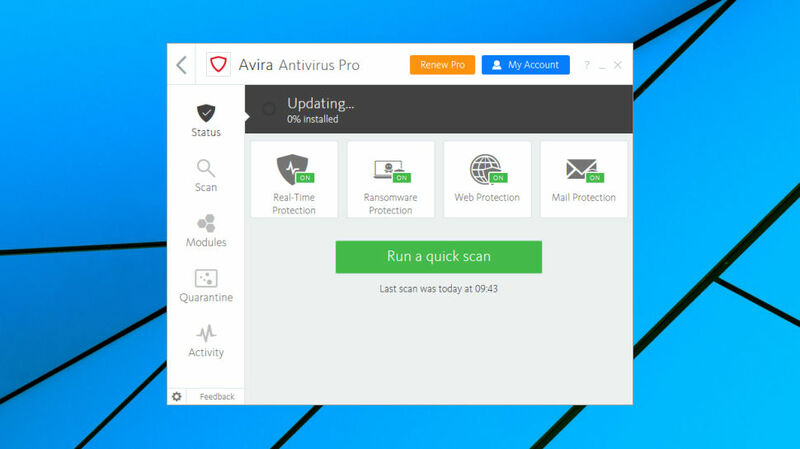 Avira Antivirus Pro has a great detection engine, but you can get almost as much functionality with Avira's free version. Even if you're happy to pay, competitors like Bitdefender give you more for a very similar price.